This fly is an old favorite but little known gem that needs to be revived. I found out about this great fly when I walked into Mike Holt’s Orvis shop, Fly Fishing Only in Fairfield, Me one day. Mike has closed the shop since that day but he showed me this fly and I want to show you. When I walked in the shop I noticed Mike carding up some orange chenille that was a great burnt orange color. I had never seen that shade before and I asked him about it. He told me about a fly created by two fishing buddies many years ago and what a fish catcher it was. The name of the fly is a combination of their two first names, Ray Betts and Jens (Jim) Riis. It is a simple fly and quite effective. If you’d like to see a video of this fly hooking salmon and trout as well as a step by step tutorial on how to tie it, check out Mike’s web site www.rotaryflytying.com. He offers a great deal for folks wanting to see videos of how this is done. For the written version, read on! I used a Mustad 9671, size 4 because that was what I had on hand. This hook is 3X long but it is close enough. There is no tail so strip some fibers off the end of your chenille and tie it onto the shank at a point over the barb of the hook. Wind a chenille body forward toward the eye and tie off. Cut the excess behind the eye, leaving enough room for the wing and a head. I bought the chenille from Mike and when his shop closed I bought more at www.theriaultflies.com. 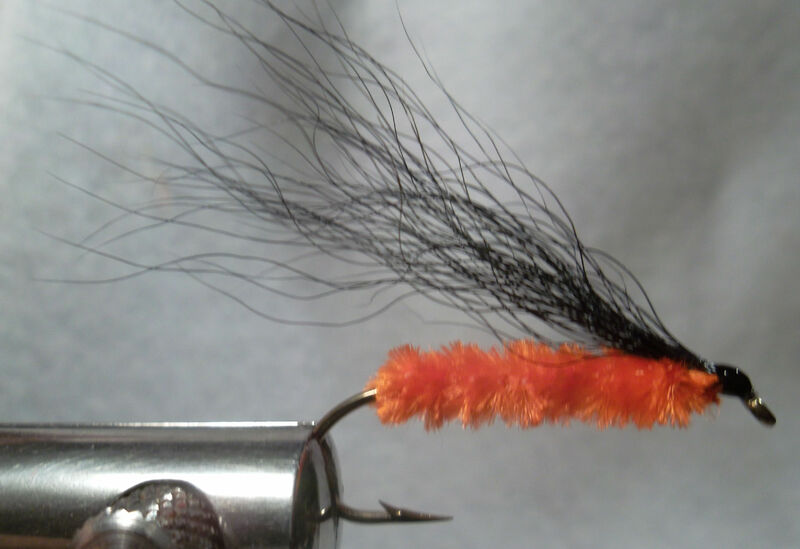 This is a great color for not only this fly but try some Wood Specials with it as well. The wing is black bear hair, tied a bit long. You can use black buck tail for a substitute. The wing should extend past the hook bend about a gap width, or maybe a bit more. Ray and Jens used black bear hair but some folks don’t have any and have trouble finding it; the buck tail will work. Those two materials are all you need and you have another of those great flies that have all but disappeared. This is one you want in your box. You heard it here first.